Today, friends, devoted followers, child-like adults, and imbibers of all ages, I’ll interest you in a bar that is new, yet has both feet in the history of London’s commerce. 45 Jermyn Street is both the eponymous name and location of Fortnum & Mason’s newest bow to fashionable dining and drinking. This street, pronounced German, is one of the sparkling highlights of the St James area, ever since Henry Jermyn, the Duke of St Albans, developed this part of the city in 1664. See, kiddies, there are things older than the Super Bowl and Nintendo. Lots of famous names have lived on this street, including Sir Isaac Newton (at Number 88, 1696-1700), The Duke of Marlborough (remember the battle of Waterloo that brought down Napoleon I? ), and Napoleon’s nephew, Louis Napoleon, who became the Emperor Napoleon III. If you’ve wandered through the St James area of the City of Westminster, London, as I’m sure my constant readers have, you’ll know it’s one of the oldest areas of the city, replete with exclusive shops (many of them suppliers of ladies and gentlemen’s attire) and some of which date back hundreds of years. Many of the shops still occupy the same buildings they did centuries ago. Need a reboot of ye old memory stick? 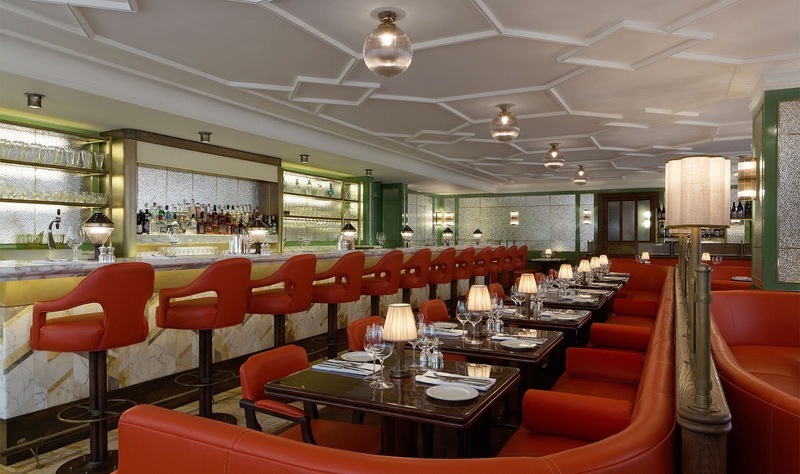 Now let’s stroll into 45 Jermyn Street and take a stool at the fabulous marble bar that glides smoothly from one end of the room to the other. Why do I say fabulous? When a man’s got a raging thirst. any dusty countertop decorated with an icy beer is fabulous. I can see you’re confused. The dusty counter top and icy beer is not a bar, it’s a joint. Now don’t get me wrong, in my misspent youth, I darkened the doorway of many a joint. But now I are sopistikated, cultivated, and swavie. 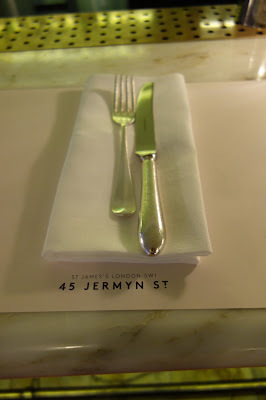 45 Jermyn Street is my new kind of place, where I find respite and solace, away from the loud, ripped jeans funny haircut people. At 45 Jermyn Street, leave the ripped jeans and flip-flops behind. Of course, you could say that about the best parts of London in general, but especially in this place, where you come to politely sip and also to learn, in an atmosphere of cultured elegance. Learn, you say? Yes, I do. Our bartender, Dean, in his upscale uniform of back slacks and waistcoat, white shirt and black tie, is a fount of information, and adept at explaining the lavish drink menu, featuring the light, the heavy, the common, and especially the tall drinks imbued with exotic flavors. This wonderful bar is only three years old and Dean has been there the whole time. 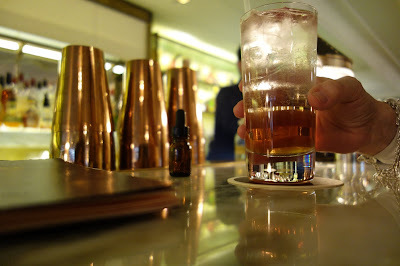 Although a young guy, working at a restaurant bar owned by Fortnum & Mason (Est1707), you know he’s been well schooled to the point of being expressively conversant on every bottle of liquor, every additive, and everything else that goes into making a cocktail that takes flight to the lofty heavens. Being a former aviator, I yearn for flights to the lofty heavens. When you order a drink, Dean, or any of the other members of the bar staff will ask you particulars. Like a strong drink? Mild? Something in between? Fruity? Sour? Sweet? Having learned your preferences, the barkeep will customize any drink to your exact specifications. It’s not just a jigger here and a jigger there, and here’s your Martini or Manhattan, or Gimlet, and that’s the way we make it. Oh, no, the cocktail in front of you is tailored to your taste. Even if this is the first time your shadow has crossed the threshold, you’re treated as a special guest. 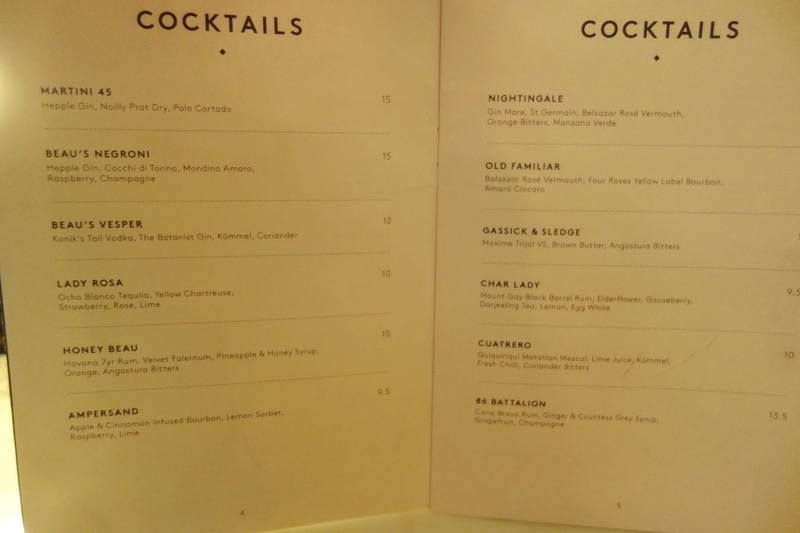 Let’s look at the bar menu. You’ll note that some of the drinks have an ingredient called acid. 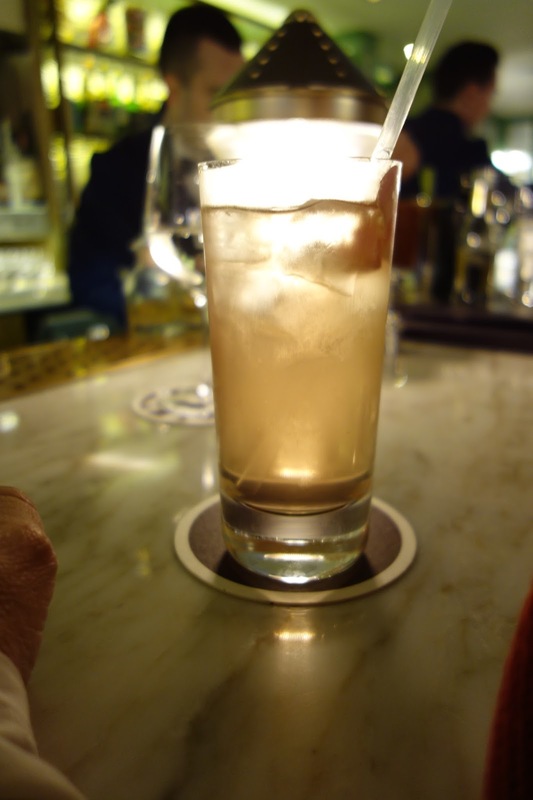 Acid can mean citrus, but it can also mean acid phosphate, which used to be common in cocktails, then disappeared, and now is making a comeback. It has about the same ph level as lime juice, and used sparingly. “It also leaves little round circles on this beautiful marble bar,” Dean says. What do the English drink these days? we ask, expecting the placid answer to be either Scotch or gin. 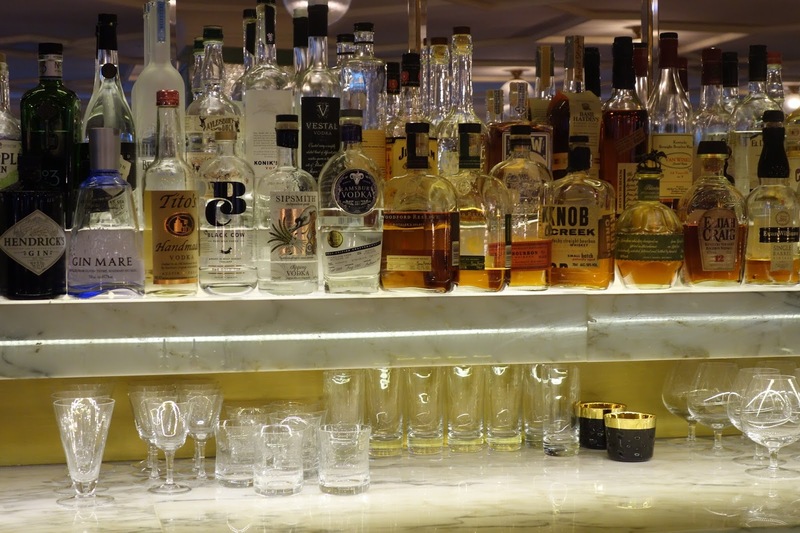 “Bourbon is really making headway,” says Dean, “We tend to go in for the sweet taste of American whiskies, but also gin,” he says, pointing to an extensive array of bottles behind the bar. There is also a collection of various flavoring made in-house. Want a gin and tonic? Even the different tonics have not escaped Dean’s practiced eye. Never knew there was much of a difference, but after a taste test of various brands, I now know differently. Some are as sweet as a soft drink, others as dry as a dry wine. 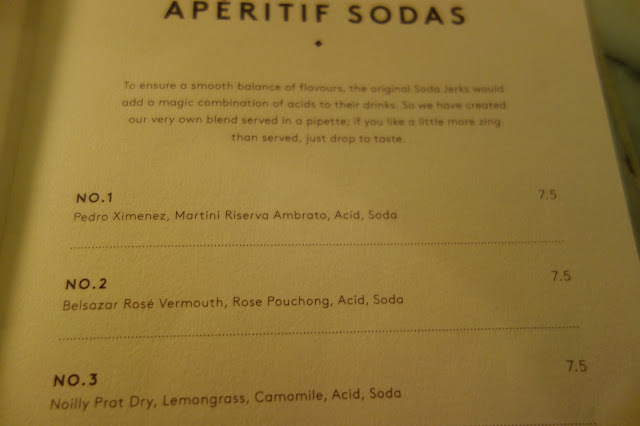 What are the aperitif sodas we see on the menu? We ask. Our leader takes us into the world of libations. “Oh, you’re going to like these. Pick one.” Dean goes on to explain that soda does not mean a drink that’s candy sweet and came out of a vending machine, but based on seltzer water infused with some acid, perhaps a fruit essence or two and a light touch of liquor. Just the thing for an afternoon of shopping, while avoiding the disadvantages of a befuddled brain and weak knees. Calms the nerves. Lightens the spirit! 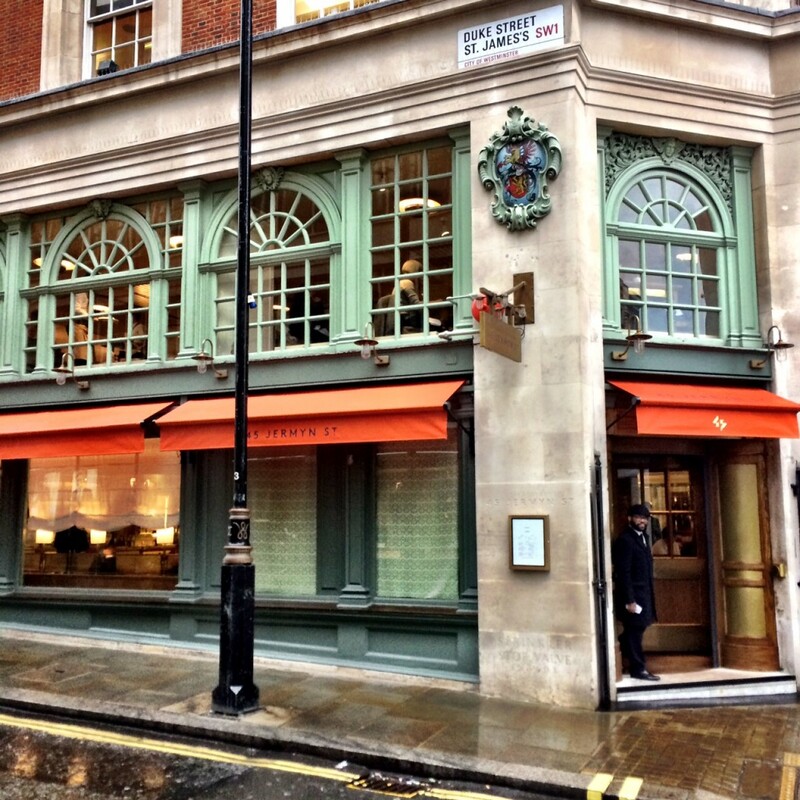 So you see, you’re not just dropping by 45 Jermyn Street for a cocktail or a wonderful lunch. Consider it a moment of pleasure among many on this famous street in perhaps London’s most excusive shopping area. JERMYN ST. AND DUKE ST.